The Writer magazine’s “runaway favorite” among readers! A humble “thank you” to everybody who cast their vote for the Atlanta Writers Conference! We took The Writer magazine “Best Writing Conferences Across America” poll by storm, amassing more votes than any other conference in the country. On Friday, May 3 and Saturday, May 4, 2019, the Atlanta Writers Club will present its nineteenth Atlanta Writers Conference, with more guests than ever before. The goal of this conference is to give you access to eight top publishing house acquisitions editors and eight literary agents actively seeking new clients, help you get your work ready for them, and educate you with a workshop and talks by experienced authors and other industry professionals. The Conference Activities page details each activity you can register for: select them all, only one, or some number in between–it’s entirely up to you, so you can craft the conference experience that will be best for your growth, interests, and budget. During the conference, you might be asked by agents and editors to send an entire manuscript or nonfiction proposal for review. Following that review, you could be offered a contract based on the materials you’ve submitted: after every conference some AWC members sign with conference guests and realize their dream of publication (see Testimonials page). You certainly will know more about how your work is perceived by industry professionals, and you’ll gain valuable experience interacting one-on-one with them. You also will have fun, learn much more about the publishing business, and get a chance to network with your peers, find writing partners, and make new friends. Our featured Friday workshop this time focuses on how to develop (or improve) your author brand, whether you write standalone books or series–and whether you are traditionally or self-published–so you can build a bigger audience and boost current or future book sales. To close out the Conference on Saturday afternoon, we will give away priz es such as a manuscript critique at the next Atlanta Writers Conference ($170 value) and hold an award ceremony, where each editor and agent will present a certificate to participants for the best manuscript sample submitted for critique and for the best pitch. Most testimonial providers were awarded a certificate and you can see how it helped to change their lives! READ ALL CONFERENCE DETAILS BEFORE YOU REGISTER! Please click the tabs at the top of the screen to read the descriptions on each of the accompanying pages and decide which activities you want to register for. If you want to meet with one or more agents and/or editors, please read the descriptions they provided on the Editors and Agents page to identify the individual(s) who are a good match for your writing project(s). Likewise, the Prep Critique Freelance Editors have provided their bios and areas of expertise. When you have decided on your activities and, if applicable, the agents and/or editors who are a good fit for you, go to the Registration tab to read the instructions there, enter the registration system, and make your selections and payment. NOTE: You must be a 2019 Atlanta Writers Club (AWC) member to participate in the conference (i.e., your dues need to be current through May 4, 2019). If you are not a current member or need to renew your membership, the registration process automatically will add $50 in nonrefundable annual dues–with membership valid for 365 days–to the total amount for the conference activities you select, as this conference was created by and for AWC members. The membership period of 365 days grants you access to two annual conferences, monthly AWC meetings, free workshops, and a writing contest with cash prizes. If you are not interested in the benefits of AWC membership, consider the $50 a nonrefundable conference registration fee. You will submit your payment at the end of the registration process. Payment via credit card, debit card, or PayPal is required to complete your registration (checks are not accepted and payment cannot be delayed). Simply follow the prompts to finish this transaction. Please complete this registration and payment process within 60 minutes of starting it. 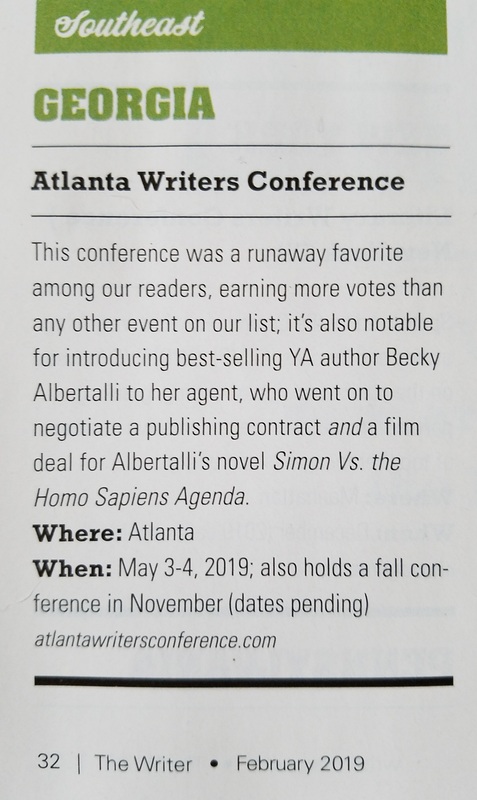 If you have any questions after reviewing all of the pages on this website, please contact Atlanta Writers Conference Director George Weinstein at awconference@gmail.com. I’m thrilled and proud to be a part of the Atlanta Writers Club. This conference is so unique in that it offers us writers an opportunity to have our work critiqued by an agent and to pitch an agent. I have attended two of these conferences and have found the experience to be incredibly educational and inspiring. I highly recommend it! Pingback: Chris Negron | Registration for the Atlanta Writers Conference is open. And it’s awesome. I went to my first conference in November 2017, met with several agents, and received positive and helpful feedback. At a round table discussion, every agent recommended conferences as an excellent way to meet agents one-on-one. It’s time well spent!